How to roast a turkey breast (boneless) - What's In The Pan? This roasted turkey breast with garlic herb butter is a great alternative to making the traditional turkey! Because you can use boneless turkey breast instead of roasting the entire turkey. This post will provide easy instructions on how to roast a turkey breast. We traveled this Thanksgiving. Since it’s just three of us, we didn’t want to make the entire turkey. But we still wanted something like a boneless turkey breast recipe that was easy to deal with. 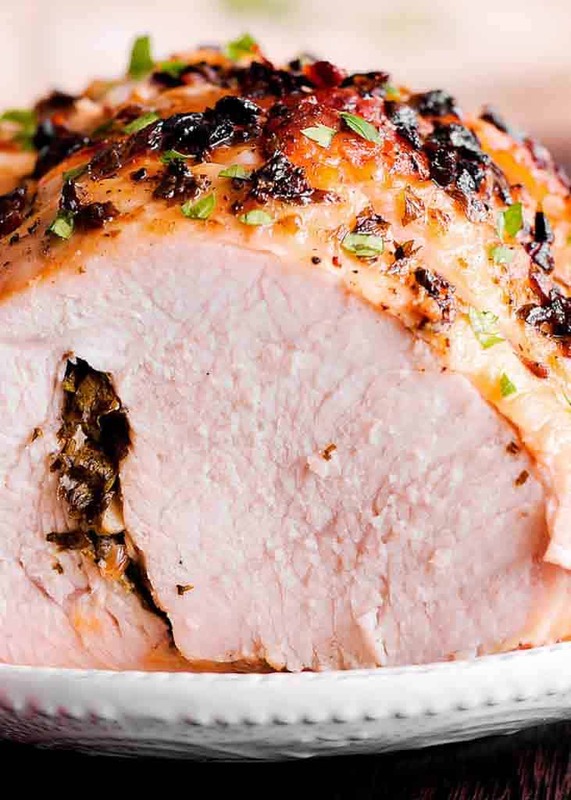 This roasted rolled turkey breast was definitely a winner! I still can’t believe that we pulled it off in a hotel room while traveling! But I must admit it’s not any special cooking skills. It’s the turkey breast recipe – so easy and so tasty, you can make it on the go! Storage of the massive throne turkey can be problematic. Do you really have all this available space in the freezer? I know I don’t. Thawing the entire turkey takes a lot of time. And you need to do it right to avoid bacteria built up. Did you know that accumulation of histamine on the meat can be dangerous? And how about the lack of freshness? 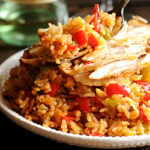 Instead, you can opt to buy either whole boneless turkey breast or butterflied turkey breast. I hope you can find the one with skin-on like I did. You will see how to roast a turkey breast in this recipe post. How many servings per boneless turkey breast? The number of servings will never be quite the same as to how much to buy. Because this is a boneless turkey breast, you will get a lot more meat for 3 pounds than from regular turkey breast. The assumption here is that a serving is 1/2 pound. And that is a nice good sized slice of turkey. This assumption leads to 6 servings of a turkey breast that is 3 pounds. By the way, this is the size most commonly found in the supermarkets. I also used 3 pound boneless turkey breast here. But on the other hand, we all overeat turkey and want leftovers. If that’s the case and if you are like me, you will only it a bit of turkey meat. For example, I eat just enough turkey to leave room for other delicious thanksgiving foods. Then you can easily stretch a 3 pound boneless turkey breast to about 8 to 10 servings. Perfect! If your boneless turkey breast came frozen, place unopened breast in cold tap water for 1 to 3 hours. Change water every 30 minutes to keep the turkey breast in the safe temperature of less than 40 degrees. I never thaw the turkey breast at room temperature. It is not safe at all because it will lead to accumulation of histamine and bacteria. We don’t want that. What temperature to cook a boneless turkey breast? I usually roast it at 375 degrees. However 350 degrees can work, but it will take a bit longer. It can also potentially dry boneless turkey breast. You will also need a roasting pan for roasting rolled boneless turkey of course! Then prepare some foil , even though it’ optional. I used it to prevents herbs from charring. 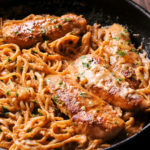 You will use kitchen twine to tie the breast. Finally, I used toothpicks to hold rolled boneless turkey in place. Even though they are optional, they held the turkey breast down really tight. Can I use oil instead of butter on the skin of the turkey? I prefer to use butter and most recipes do as well. However crisp skin hates moisture and unfortunately butter is 20% water. But oil has no water content. Yeah! So if you want an assuredly crispy skin, it’s a good idea to use oil and not butter. 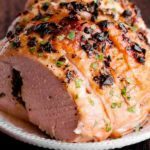 You can make this rolled turkey breast instead of a traditional full size bone in skin on turkey. I use it as lunch meat because it’s perfectly juicy and not dry at all, unlike the usual dry leftover turkey. Make boneless turkey breast for a weeknight dinner and prepare a gravy to dip the slices in. So yummy! 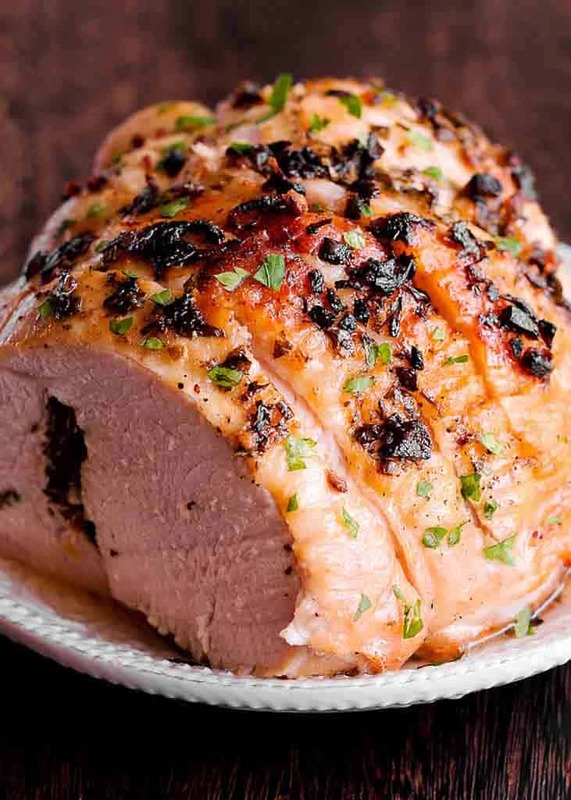 Finally, you can serve this amazing rolled turkey breast for Christmas! The beauty of this boneless turkey recipe is that you can make it two days ahead. And with no loss of flavor or moisture! Besides it will have a lot more flavor than the usual recipe for the entire bird. The ingredients that give this roasted rolled turkey breast such a great flavor include lemon zest, and crushed garlic and butter. Because they get rolled both into the turkey as well as rubbed on the outside. And of course herbs! I used parsley, thyme, sage and rosemary. But be creative and use your own combination. Once the turkey breast is roasted, we come to the fun part. Let’s slice it! Roasted turkey breast should be sliced pretty thinly for the best roasted rolled turkey experience. Carve slowly and steadily while increasing the pressure. 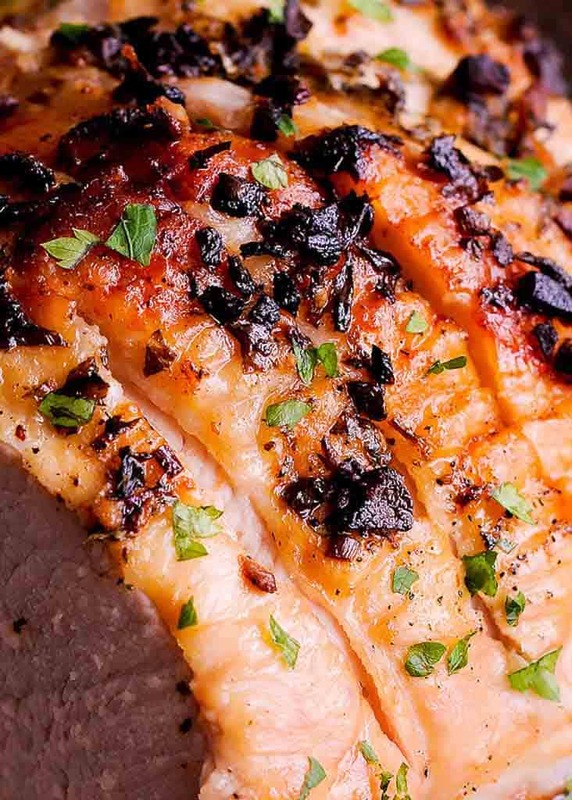 This will ensure that every slice has a bit of skin since it’s just loaded with flavor. You don’t want anyone to miss out on it, do you? Try it for yourself and see how easy it is to enjoy making this flavorful roasted turkey breast instead of the whole turkey! 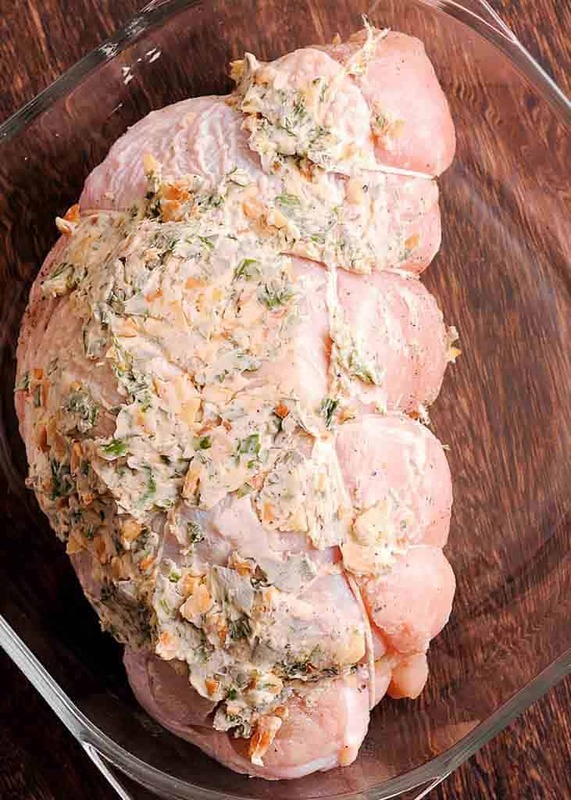 This roasted rolled turkey breast with garlic herb butter recipe is a great alternative to making the entire turkey. When you don’t feel like cooking the entire turkey, don’t have time for it or just want to make something different, this is the turkey recipe to try. Garlic Herb Butter: Melt 1 tbsp butter in a medium skillet, add 6 cloves of minced garlic and cook until fragrant. Turn off heat and add 2 tbsp fresh herbs, 1 tsp fresh lemon zest and 1/2 tsp salt. Mix well. Preparing Rolled Turkey: Lay turkey breast, skin side down, and season with 1 teaspoon salt and 1/2 teaspoon pepper. Set aside. Rub garlic herb butter from step 1 all over the underside of turkey and under the skin. Roll the turkey to form a tube and use toothpicks (or fingers:) to hold it tight in place. Using kitchen twine, tie it around the turkey to keep it from opening up during roasting. Rub the remaining herb butter on top of the roll. Roasting Rolled Turkey: Preheat oven to 375 F. Place in a roasting pan or a baking dish and bake until an instant-read thermometer registers 160 degrees to 165 degrees, about 1 hour to 1 hour 15 minutes total. Remove from oven, and let rest for 10 minutes. Transfer to a cutting board, remove twine, and cut crosswise into 1/2- to 1-inch-thick slices. Place slices on a platter, and garnish with parsley. Notes: Calories is per serving. You may also like this Brown Sugar Dijon Pork Loin. 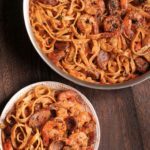 Follow me on PINTEREST and INSTAGRAM to get more recipe ideas! This was very easy and good. The entire family enjoyed it. I was super happy how my turkey breast turned out. The herb combo was excellent. I cooked mine using only extra virgin olive oil, no butter. The skin was perfect, the meat juicy and savory. I will be using this recipe again. I had 3 people over besides myself. It was a 5lb breast and there were NO leftovers. Kinda sad I won’t be having a sandwich tomorrow. Thank you so much for such a kind review Jay! Delicious.!! Made it for dinner last night and it was a huge success.!!! 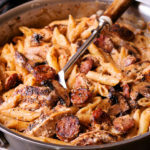 So tender, flavorful and easy. My husband looooved it and even had it for breakfast today. Can you buy a boneless turkey breast with the skin-on? Yes, I bought it at a regular supermarket. This turned out really good!